KKTCSG-301 (left) and KKTCSG-303 with their crews. Photo: Armed Forces of Northern Cyprus. 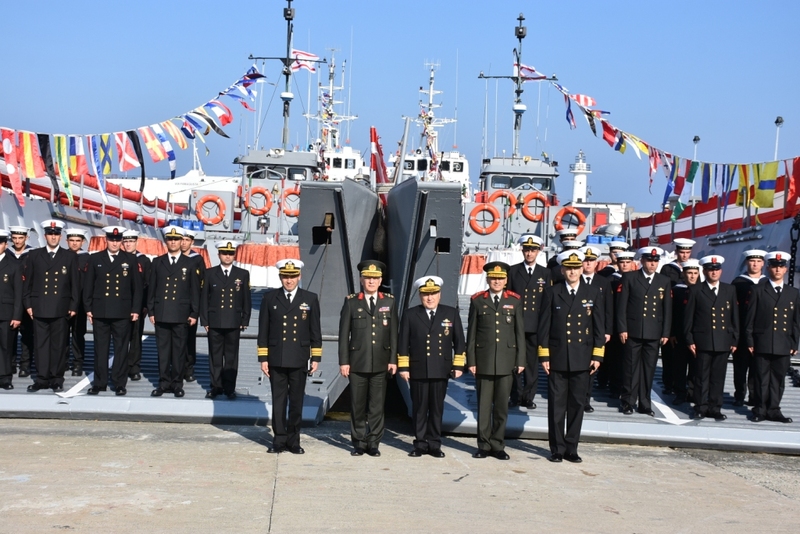 Turkish Navy donated two naval vessels to Turkish Republic of Northern Cyprus Coast Guard. The vessels are former small landing craft of Ç-302 class. The boats are renamed as KKTCSG-301 and KKTCSG-303 and commissioned into service on 18 January 2017. Each of these boats can carry 60 tons of load or 140 troops. Their maximum speed is 10 knots. On a different note, the Sultanate of Oman is donating, a large patrol boat to Cyprus. The ship in question is believed to be Al Mabrukah. She was build in 1970 in UK and commissioned in Sultan of Oman Navy in 1971 as the yacht for the sultan. She was converted to a training ship in 1983. In 1997 she was classified as patrol ship and used as one since.